The PLA Ultimaker is optimised for Ultimaker machines. This PLA is biodegradable and made from organic material (starch). The PLA Ultimaker is mainly used for non-functional prototyping. 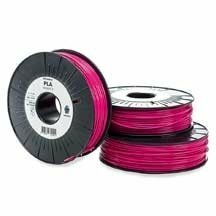 This PLA is available in many colours in a 2.85mm diameter. The print parameters are set automatically if this PLA Ultimaker is used on the brand's own machines. Ultimaker, one of the major players in the world of 3D printing, recognised for its high-quality 3D printers, is now offering you its Ultimaker filaments. They are particularly suitable for use with Ultimaker printers which have predefined profiles to work with these filaments and thus make it even easier to use Ultimaker 3D printers. The PLA Ultimaker is a high-quality consumable, designed by Ultimaker for its machines in order to offer a quality product to its customers. It allows the creation of many pieces and respects the environment and your health, indeed the PLA Ultimaker is biodegradable and emits very few particles upon printing making this Ultimaker filament ideal for prototyping but also for use in an educational environment due to its ease of use.